Fluoroscopy /flɔrˈɒskəpi/ is an imaging technique that uses X-rays to obtain real-time moving images of the interior of an object.In its primary application of medical imaging,a fluoroscope /ˈflɔrɵˌskoʊp/ allows a physician to see the internal structure and function of a patient,so that the pumping action of the heart or the motion of swallowing,for example,can be watched.This is useful for both diagnosis and therapy and occurs in general radiology,interventional radiology,and image-guided surgery.In its simplest form,a fluoroscope consists of an X-ray source and a fluorescent screen,between which a patient is placed.However,since the 1950s most fluoroscopes have included X-ray image intensifiers and cameras as well,to improve the image's visibility and make it available on a remote display screen.For many decades fluoroscopy tended to produce live pictures that were not recorded,but since the 1960s,as technology improved,recording and playback became the norm. Fluoroscopy is similar to radiography and X-ray computed tomography (X-ray CT) in that it generates images using X-rays.The original difference was that radiography fixed still images on film whereas fluoroscopy provided live moving pictures that were not stored.However,today radiography,CT,and fluoroscopy are all digital imaging modes with image analysis software and data storage and retrieval. 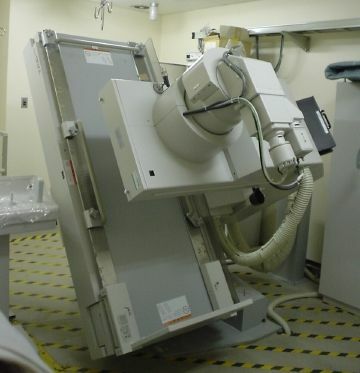 The use of X-rays,a form of ionizing radiation,requires the potential risks from a procedure to be carefully balanced with the benefits of the procedure to the patient.Because the patient must be exposed to a continuous source of x-rays instead of a momentary pulse,a fluoroscopy procedure generally subjects a patient to a higher absorbed dose of radiation than an ordinary (still) radiograph.Much research has been directed toward reducing radiation exposure,and recent advances in fluoroscopy technology such as digital image processing and flat panel detectors,have resulted in much lower radiation doses than former procedures. The type of fluoroscopy used in airport security (to check for hidden weapons or bombs) uses lower doses of radiation than medical fluoroscopy.It was formerly also used in retail stores in the form of shoe-fitting fluoroscopes,but such use was discontinued because it is no longer considered acceptable to use radiation exposure,however small the dose,for nonessential purposes.Only important applications such as health care,bodily safety,food safety,nondestructive testing,and scientific research meet the risk-benefit threshold for use.The reason for higher doses in medical applications is that they are more demanding about tissue contrast,and for the same reason they sometimes require contrast media.